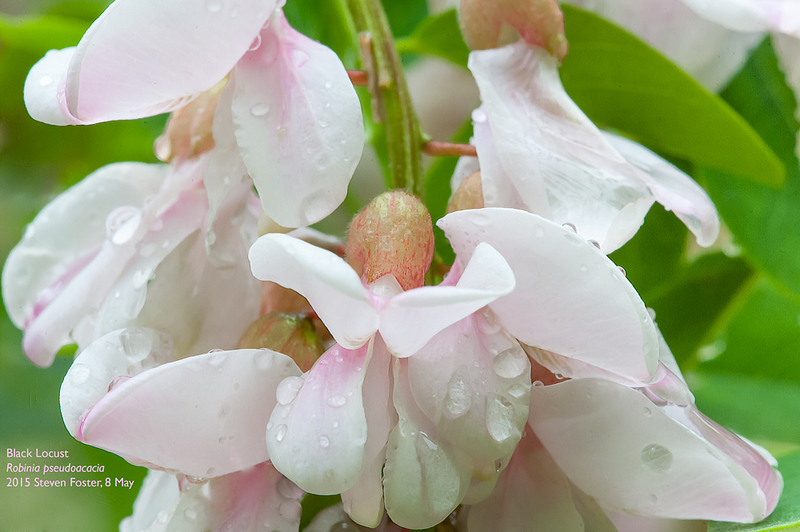 Several times in the last week, people have asked what is that tree with the white or pinkish pendulous clusters of pea-like flowers? 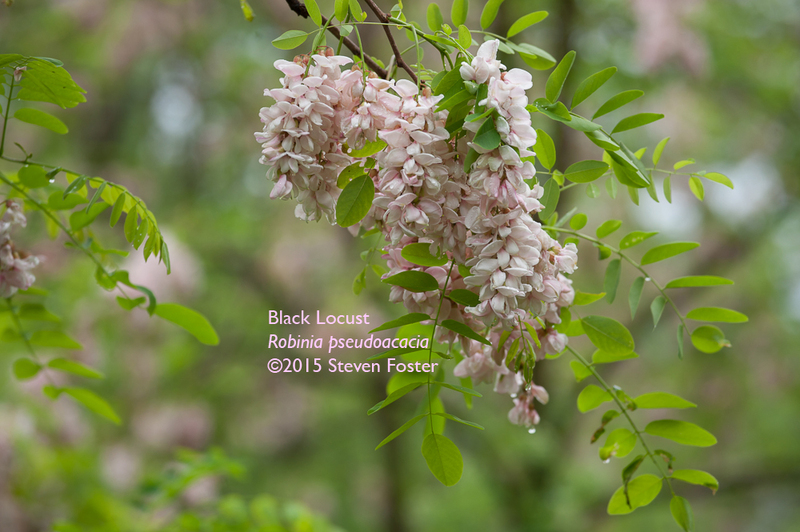 It is Black Locust (Robinia pseudoacacia), a very early introduction from North America to Europe. Go almost anywhere in Europe or temperate Asia today, and the “Virginia acacia”—our Black Locust—is widely planted as a street tree, and appears as if part of the native landscape. In his 1823 Sylva Florifera, Henry Phillips, tell us that American Indians made a declaration of love by presenting a branch of this tree in blossom to the object of their attachment. No doubt our native Black Locust itself was the object of desire. “Of all exotic trees,” Phillips writes, ” with which we have adorned our native groves, this North American stands first”. Our common Black Locust was fancied by early missionaries to be the Egyptian acacia that supported St. John in the wilderness. They were wrong, so it was called “false acacia,” thus the species designation “pseudoacacia.” It was introduced to Europe at a very early date and planted with religious zeal. 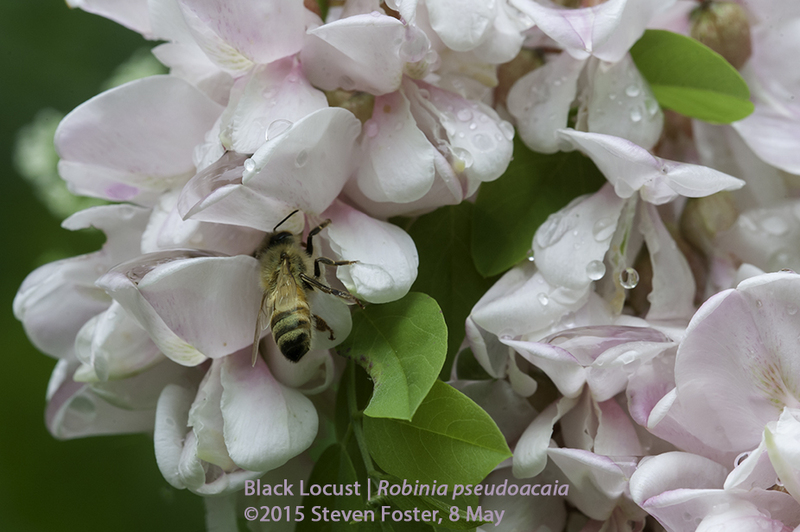 The name Robinia honors Jean Robin (1550-1620) a Parisian apothecary recognized as one of the best French botanists of his time. Henry III appointed him herbalist and arborist at the gardens of the Louvre. His son, Vaspasian Robin (1579-1660) continued his father’s work and planted the tree in the Jardin des Plantes in Paris by 1636. John Parkinson (1567-1650) first described it in his monumental Theatrum Botanicum (Theatre of Plants), published in 1640. By the 1660s our woodland waif was widely planted as a street tree throughout Paris and London. The love affair continues over 400 years later. Just last week, I posted a photo of the flowers on Facebook, and a friend from Turkey noted it is common avenue tree there, and that as a child, he ate the flowers. Other chimed in that the sweetly fragrant flowers dipped in cool water are delicious, or that dressed with oil and balsamic vinegar, the flowers are a nice addition to salads, and are great added to pancakes. The heady fragrance was blamed, too, for inducing nausea and headaches, though that accusation has the odor of a swooning Victorian suffering from unrequited love. For better or worse, this is one American tree that we rediscover each spring!